One month from today, around half past nine in the morning, there's going to be a total solar eclipse. Have you planned ahead yet to make sure you don't miss it? To be clear, the eclipse is only going to be total on the Faroe Islands and Svalbard, and along a long line through the North Atlantic between Rockall and Iceland, so will be partial as seen from the UK. But it is the closest a total solar eclipse comes to Britain for a very long time, and in London around 85% of the Sun will be covered. To give you some idea of how rare this is, here's a list of all London's partial solar eclipses with over 80% of the Sun obscured, during the last century and this. There are only nine. A few of these are total eclipses elsewhere in Britain, but not in London, and these are in bold. The 1999 eclipse famously blotted out Cornwall, or would have done had it not been cloudy, while the 2090 eclipse brings totality to England south of a line between Exmoor and Hastings. But there is a serious drought of major partial eclipses coming up - for most Londoners only one more during the rest of their lifetime - while no total eclipse will be visible from the capital until 2151! 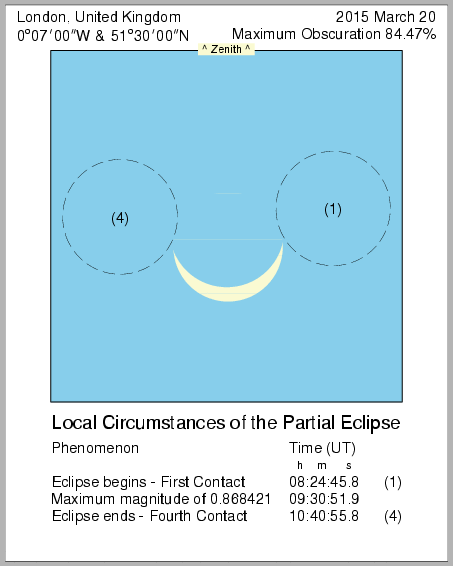 The next major partial eclipse takes place on the morning of Friday 20th March 2015, just after breakfast time. In London the maximum eclipse will be at 9.31am, with the first bite an hour earlier and the whole thing over at half ten. These times are much the same across the whole of England, running a few minutes earlier in the southwest and a few minutes later in the north. But what's not the same is how much of the Sun is eaten away, which varies from 83% to 97% across the whole of the UK. In London, the percentage of the Sun obscured is about 84%. More precisely it ranges from 84.0% in Orpington to 84.9% in Harefield, hitting 84.41% at Trafalgar Square in the centre of town. Essentially it doesn't matter where in London you are, weather permitting, the Sun'll look like the horned sliver at the top of today's post. But if you live in (or travel to) other parts of the United Kingdom, more of the Sun gets covered and the sky will be a little bit dimmer. Don't expect it to get dark, but if the Sun's out the morning's going to feel uncharacteristically dusky. This map shows the maximum percentage of the Sun that'll be covered at around half past nine in the morning on Friday 20th March 2015. The brightest place to be will be Dover at 83%, whereas South Wales and the Midlands will see coverage around 87-88%. Liverpool loses just under 90% and Blackpool just over, with Newcastle not much further ahead at 91%. Once you hit central Scotland only 6% of the Sun remains visible, falling to 4% in Inverness. But it's the outer islands nearest to the line of totality which see the greatest UK eclipse, with the Shetlands at 97% and the Outer Hebrides at 98%. Alas they also have the worst weather prospects, but then the whole thing's a cloud lottery anyway so you might see something amazing or you might see nothing at all. I have to caution at this point about never looking directly at the Sun. The last thing you want is a fingernail-shaped burn on your retina, or even blindness, for the rest of your life. A well-placed cloud might allow you to squint at the outline of the eclipse out of the corner of your eye, not that I'm specifically recommending this. Personally I'm going to whip out my eclipse glasses I got for Cornwall 1999 because they're very carefully filtered, and who knows I might even get to use them this time. To give you some idea of the scale of the 2015 event, think back to what you saw (or didn't) in 1999. London for example saw a 97% eclipse that day, and this is only 84%. Below is a table giving these percentages for other towns across the UK. Glasgow for example does better in 2015 than it did in 1999 (94% compared with 91%), while Liverpool and Newcastle will see something much the same. I've also added a column for the next big partial eclipse in 2026, just to show you the best you can hope for in your location during the rest of your lifetime. I sourced all these figures from NASA's interactive eclipse maps, which allow you to click anywhere in the world and read off all the times and percentages you need. Here's 1999, here's 2015, here's 2026, and here's the next UK total eclipse in 2090. You can check out every London solar eclipse for a thousand years hence here, or visualise them all from 1500 to 2100 here. It's impressive stuff. And I mention all this now, a month in advance, simply to give you to time to plan. Can you ensure you won't be stuck inside a building around half past nine on Friday morning in a month's time, to give you the very best chance to see the heavenly spectacle. It won't be the most amazing thing ever, merely a one-seventh-sized two-pronged star in a dimmer than usual sky. But a particularly rare natural spectacle will be occurring, clouds permitting, and after this you've probably only got one big one left.